The Unassuming Economist | Public good or private wealth? Free up women’s time by easing the millions of unpaid hours they spend every day caring for their families and homes. Let those who do this essential work have a say in budget decisions and make freeing up women’s time a key objective of government spending. Invest in public services including water, electricity and childcare that reduce the time needed to do this unpaid work. Design all public services in a way that works for those with little time to spare. End the under-taxation of rich individuals and corporations. Tax wealth and capital at fairer levels. Stop the race to the bottom on personal income and corporate taxes. Eliminate tax avoidance and evasion by corporates and the super-rich. Agree a new set of global rules and institutions to fundamentally redesign the tax system to make it fair, with developing countries having an equal seat at the table. The gap between rich and poor is pulling us apart. It stops us from beating poverty and achieving equality between women and men. Yet most of our political leaders are failing to reduce this dangerous divide. It does not have to be this way. Inequality is not inevitable – it is a political choice.8 Concrete steps can be taken to reduce it. This report focuses on the unparalleled power of universal public services like education and health in tackling poverty and reducing inequality.9 Universal public services are the foundation of free and fair societies. If they choose to do so, governments can deliver life-saving public services for all their citizens. There is a growing consensus that the wealth of individuals and corporations is not being adequately taxed, and instead taxes are falling disproportionately on working people. For every dollar of tax revenue, on average just 4 cents are made up of revenue from wealth taxes. The fortunes of the world’s super-rich have grown to record levels. 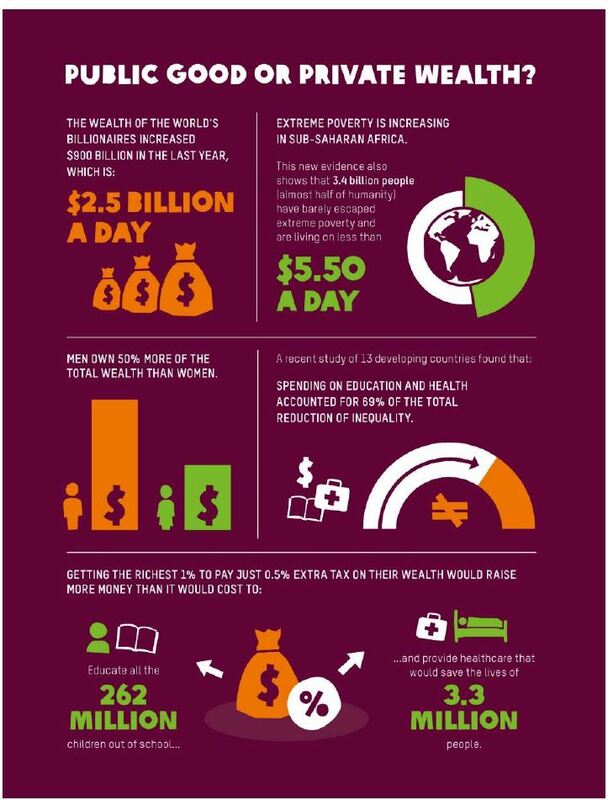 By taxing wealth more fairly, enough money could be raised globally to ensure that every child goes to school and no one is bankrupted by the cost of medical treatment for their families. In doing this, it is possible to build a more Human Economy– one that is more equal and values what truly matters. One of the great achievements in recent decades has been the huge reduction in the numbers of people living in extreme poverty, defined by the World Bank as $1.90 per person per day. Yet new evidence from the World Bank shows that the rate of poverty reduction has halved since 2013. Extreme poverty is actually increasing in sub-Saharan Africa. This new evidence also shows that much of humanity has barely escaped poverty, with just under half the world’s population – 3.4 billion people – subsisting on less than $5.50 a day, which is the World Bank’s new poverty line for extreme poverty in upper-middle-income countries. The Bank finds that women are more often among the poorest people, particularly during their reproductive years, because of the level of unpaid care work they are expected to do. This is a direct result of inequality, and of prosperity accruing disproportionately to those at the top for decades. The World Inequality Report 2018 showed that between 1980 and 2016 the poorest 50% of humanity only captured 12 cents in every dollar of global income growth. By contrast, the top 1% captured 27 cents of every dollar. The lesson is clear: to beat poverty, we must fight inequality. 262 million children will not be allowed to go to school. Almost 10,000 people will die because they cannot access healthcare.